Editor’s Note: This is the first post in a new, lengthy series that will highlight ten or more public university honors colleges and programs that are (1) excellent academically and (2) offer substantial merit aid either through the honors program or the university as a whole. We begin the series with The Ohio State Honors And Scholars Program because it meets the criteria above and because we have been unable to review it in our two previous books. The program is coordinated by an honors team but delegates much of the course programming to major departments. The result is great for honors students but extremely difficult for us to measure for rating purposes. The decentralized approach allows for the program to work with more than 5,000 students, making the program one of the largest in the nation. Before a discussion of highly competitive merit awards for OSU students, it should be said that the University Honors Program is extremely selective despite its large enrollment. Our estimate of the average new SAT score for current students is 1470-1490, with an average ACT of 32-33. This equates to roughly the top 10% of OSU students. 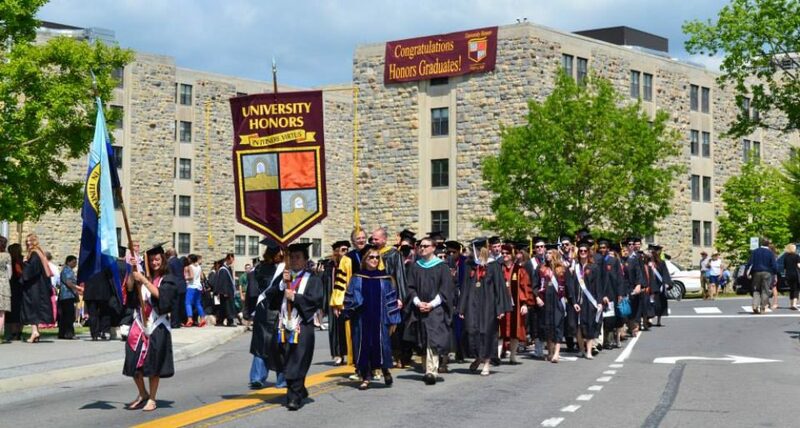 While the university-wide six-year graduation rate is about 83%, the honors grad rate is about 91-92%. University Honors students can choose from 250-300 courses each term. More than a thousand first-year students enroll each fall. About 60% of first-year students (more than a thousand) choose among three main honors residence halls. Each residence has its own honor-related programming. Two of the residences are air-conditioned. The remainder of first-year honors students reside in other university residence halls, many of which have living/learning themes. The Honors Program coordinates the Eminence Fellowship, the most lucrative and prestigious award at the university. Eminence Fellows receive a “full ride” to OSU. In 2917, there were 17 fellows, all members of the honors program. Given the high selectivity of the honors program, it is no surprise to find that fellows typically rank in the top three percent of their graduating classes and have an ACT composite score of 34 or higher or SAT combined Critical Reading and Math score of 1520 or higher. Yet even impressive stats do not guarantee a fellowship. “Eminence Fellows demonstrate academic achievement, intellectual curiosity, high regard for humanity, and significant involvement both on and off campus.” Measuring factors such as a “high regard for humanity” is difficult, and so is the winnowing of fellowship applicants: more than 1,200 apply and only 17 fellowships were awarded in 2017. On the other hand, the university awards about 300 Morrill Scholarships each year. The scholarships require both strong academic qualifications and characteristics that contribute to the diversity of the university. Here, diversity means more than a racial or ethnic profile. The “targeted” students include not only ethnic and racial minorities but also first-generation, low-income, and Ohio Appalachian students. In addition, the awards may go to students whose gender is not typical of the major (e.g., women in engineering), or whose major is atypical but desirable (e.g., agriculture). Notably, Agriculture is one of the disciplines that offer many honors courses via the University Honors Program. Distinction equals the value of the cost of attendance for both Ohio residents and nonresidents, or a “full ride.” Only about 25 of the 300 Morrill awards are at the Distinction level. One hundred students are invited to interview for the 25 awards. Recipients likely need ACT 33 or new SAT ~1500 along with an extremely high class rank and achievements. Prominence equals free tuition for out-of-state students. Excellence: Equals the value of in-state tuition for Ohio residents. The minimum stats for Prominence or Excellence awards are about 28 ACT or new SAT ~1320. It is also possible to receive a Maximus Scholarship based mostly on stats and then be considered, usually later, for a Morrill or even Eminence award. The Maximus minimum stats requirement is high (top 3%, 32 ACT or 1450 new SAT) but not related to diversity goals as far as we can tell. The award approximates half the cost of in-state tuition, or about $5,000. Finally, Provost and Trustees awards are $2,500 and $1,500 a year, respectively. The Provost minimum requirement is top 10%, 30 ACT, or new SAT of 1390. The minimum requirement for Trustees is top 20%, 29 ACT, or new SAT 1350 or higher. Whether we need it or not, there is a new ranking on the scene, the Wall Street Journal/Times Higher Education College Rankings 2017. There are some interesting features, and the rankings are certainly worth a look. The rankings combine national universities and liberal arts colleges into one group, and in this way resemble the Forbes rankings. And, also like the Forbes rankings, the salaries earned by graduates also count as a metric, 12% of the total in the WSJ/THE rankings. Farther down, we will list the top 100 colleges in the rankings. Only 20 of the top 100 schools are public; 31 are liberal arts colleges; and the remaining 49 are elite private universities. This is not much of a surprise, given that financial resources are a major ranking category. To what extent does the teaching at your university or college support CRITICAL THINKING? To what extent did the classes you took in your college or university so far CHALLENGE YOU? To what extent does the teaching at your university or college support REFLECTION UPON, OR MAKING CONNECTIONS AMONG, things you have learned? To what extent does the teaching at your university or college support APPLYING YOUR LEARNING to the real world? If a friend or family member were considering going to university, based on your experience, how likely or unlikely are you to RECOMMEND your college or university to them? To what extent do you have the opportunity to INTERACT WITH THE FACULTY and teachers at your college or university as part of your learning experience? To what extent does your college or university provide opportunities for COLLABORATIVE LEARNING? D. Number of accredited programs (by CIP code): 3%. This metric is IPEDS standardized number of Bachelor’s degree programs offered. A. Graduation rate: 11%. This metric is 150% of the graduation rate status as of 31 August 2014 for the cohort of full-time, first-time degree/certificate-seeking undergraduates, Bachelor’s or equivalent sub-cohort. B. Graduate salary: 12%. This metric estimates the outcome of median earnings of students working and not enrolled 10 years after entry. C. Loan default/repayment rates: 7%. This metric estimates the outcome of the 3-year repayment rate from College Scorecard data. The value added component is the difference between actual and predicted (based on underlying student and College characteristics) outcomes. D. Reputation: 10%. This metric is the number of votes obtained from the reputation survey, and is calculated as the number of US teaching votes from the reputation survey and the number of US-only teaching votes from country section of the reputation survey. The two remaining umbrella categories measure Financial Resources, including the amount spent per student; and the Environment, including the diversity of enrolled students (or faculty) across various ethnic groups. You can find a summary of the methodology here.